By 1857, six iron furnaces had been constructed in Clinton County. Of these, only two remain -- one at Farrandsville, located 5.2 miles north of Lock Haven, and the other on state forest land accessible only to the experienced outdoor enthusiast. 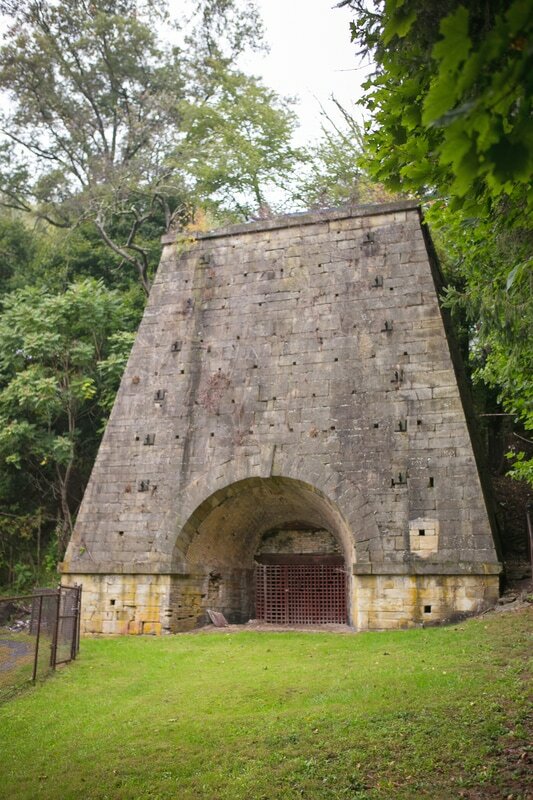 Completed in 1837, the Farrandsville Iron Furnace was the first and largest coke-fired hot-blast iron furnace in North America, reaching a height of 54 feet. An excellent example of dry masonry construction it produced 50 tons of high quality pig iron per week using equipment imported from Scotland. It is listed on the National Register of Historic Places. Commercial brick making in Clinton County began in the early 19th Century and was then associated with the Iron making Industry. The first firebrick made in Pennsylvania was produced in Farrandsville. Bricks made in Clinton County are visible in the Walkways at the Heisey Museum.